Net Worth of Taiwan's 40 Richest Up 27% to US$70 Bil. 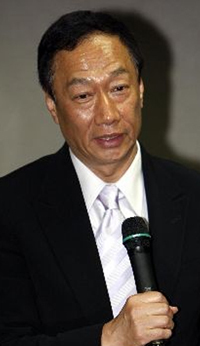 Singapore — Electronics magnate Terry Gou has claimed the richest Taiwanesetitle in the latest Taiwan rich list published by Forbes Asia. Gou, founder of the world’s largest contract electronics manufacturer Hon Hai Precision Industry, is worth US$5.9billion, up 79% from last year’s $3.3 billion. Ranked fourth last year, he is also the biggest gainer in dollar terms this year. Gou is expanding his flat-panel business following themerger of his unit Innolux with Shi Wen Long’s (No. 20; $1.1 billion) Chi MeiOptoelectronics.The Hon Hai founder is one of 11 entrepreneurs on the list with businesses in thetechnology sector. The recovering industry has boosted their combined wealth to $19.65billion from $12.4 billion last year, when there were only eight technology tycoons on the list. This year the combined net worth of Taiwan’s 40 richest is US$70 billion, up 27% from last year’s $55 billion, thanks to a pickup in demand for exports from the island. Thelatest combined wealth is still $7 billion shy of the 2008 record. The minimum net worth to make it to the list this year is $675 million, up from $550 million previously. The island nowhas 20 billionaires compared with 17 last year. Losing the top spot to Gou are the Tsai brothers who control Cathay Holdings. Ranked No. 2 this year, the brothers are worth $5.8 billion, up slightly from last year’s $5.1 billion. Their finance firm’s stock has been up since last year’s list. Also slipping one notch is Tsai Wan-tsai, founder of Fubon Group and uncle of theTsai brothers. He is ranked No. 3 this year with a net worth of $5.3 billion, up from $4.2billion in 2009. Tsai has a 20% stake in Xiamen City Commercial Bank and is looking to expand in China’s insurance market. 10) Wang Yung-tsai; $2.2 billionNet worths were estimated using shareholder information from stock exchanges oranalysts. Stock prices and exchange rates were locked in on March 19. Private companies were valued through comparison with prevailing price-to-earnings or other financial ratios. For more information, visit www.forbes.com/taiwan. Forbes Media encompasses Forbes and Forbes.com, the #1 business site on the Web that reaches on averagemore than 17 million people monthly. The company publishes Forbes and Forbes Asia, which together reach a worldwide audience of more than 6 million readers. It also publishes ForbesLife and ForbesWoman magazines,in addition to licensee editions in China, Croatia, India, Israel, Korea, Poland, Romania, Russia and Turkey. Other Forbes Media Web sites are: Investopedia.com; RealClearPolitics.com; RealClearMarkets.com; RealClearSports.com; and the Forbes.com Business and Finance Blog Network. Together with Forbes.com,these sites reach on average nearly 40 million business decision makers each month.